Today, I will be participating in a World Climate Mock UN Negotiation as a member of the Press Corps. My task is to communicate the results of the negotiations to the public. While I may not hold any negotiating power, my power to influence as a journalist can be almost greater. I chose to represent the Guardian for this simulation because it is a new, highly active organization that is a leader in environmental coverage. The Guardian was originally founded in 1821, with an environmental section first appearing around the year 2000. Hot topics at the time mostly revolved around genetically modified foods, with few news stories related to climate change. Now, many news stories written by the Guardian Environment, focus around some aspect of climate change. Scientific consensus is a large focus of theGuardian’scoverage of climate change, especially in the United States. A subsection of their climate change area called Climate Consensus – the 97% is dedicated to this topic alone. In editorials, the Guardian discusses how they feel “almost certain” that manmade climate change is happening and expresses high belief in the scientific consensus, citing recent scientific discoveries such as the link between climate change and droughts in Kenya, and the three 500-year floods that Houston has experienced in a short three-year time span. News articles on the topic often take a more critical focus, examining how climate denial and skeptics interact with the scientific consensus especially among groups within the United States. The Guardian conducted a study into the issue, breaking apart the climate deniers’ position that scientific consensus is a myth. Public opinion of climate change is commonly discussed in a number of news outlets. The Guardian analyzes the factors contributing to U.S. public opinion, and those factors that may be holding people back. One editorial piece describes how fossil fuel companies have led a campaign to mislead voters, resulting in decreased public opinion of climate change. Recent news stories focus on current climate policies supported by Americans that, unfortunately, have little chance of getting passed regardless of public opinion and support. Societal change is a necessary component of climate action. Editorials in the Guardian present how climate litigation, enforcing policies, and holding large fossil fuel companies accountable for action, may be viable paths toward climate action. They acknowledge that the Paris Agreement is good, but that “Big Carbon” has influenced many politics. News stories take a more positive light focusing on recent innovations and initiatives that are taking steps toward overall societal change. 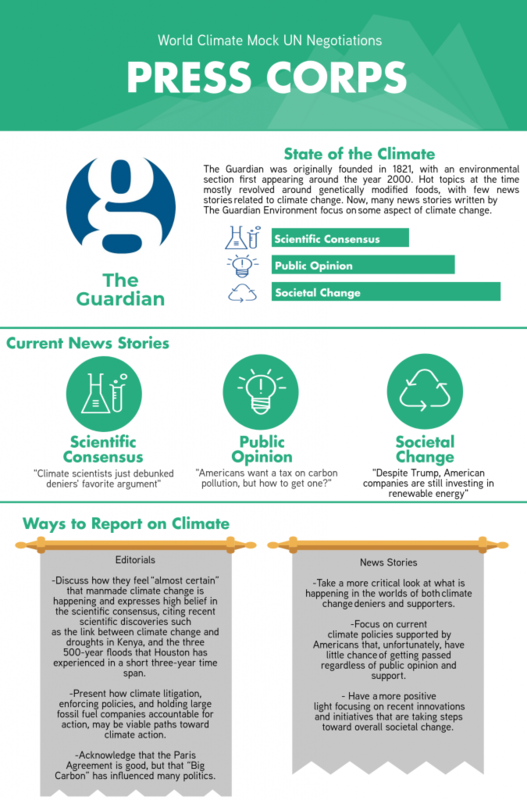 The Guardian utilizes many strategies to connect with and engage readers about climate change. Many news articles are solutions focused, presenting ways for readers to get involved with the discussion or take action. They connect with sites across the globe and partner with many groups, such as their recent partnering with the Skoll Foundation to create a serious on current climate impacts and solutions. The Guardian Environment is an award-winning reporting team focused on delivering authentic journalism that communicates the news and discusses issues related to climate change and other environmental topics in a way that informs the reader and supports societal change.